In JJ’s book, there is a sharp contrast between those who follow the light (Becomers) and those who follow the dark (Be-ers). But I would think that even in following the path of the dark, there would be a process of becoming darker. So wouldn’t they also be Becoming? Actually there are three paths in the overall picture. The path of Becoming which all of us are on who incarnated on this earth and are moving forward in any degree. The second path (technically a non path) is the path of Being. This state is realized and incorporated with Becoming for disciples. However the state of Being with no Becoming is had by those who did not decide to incarnate. These entities just are and will not have the opportunity to Become for another eternity. The third path is followed by the Dark Brothers. Even though they may teach many concepts borrowed from the Brotherhood of light and also many false concepts that does not even apply to them, their path is actually the opposite of Becoming. This opposite path is not Being, but could be called “unbecoming” or perhaps an “unraveling.” That individual identity that they are, that has been in the building stages for millions of years is becoming unraveled and disintegrating back to the Source because of their total rejection of the light. Without a thread to their Soul the life begins to go out until they become an empty shell and dissolve back to their native element. But even with this tragedy all is not lost. Billions of years hence a new attempt will be made to rebuild the failed reflection until finally the glory of God will be made manifest. By that time, however, his old friends will have progressed far beyond him and they will never associate on the same level again in this eternity. Fortunately, few ever progress this far along the dark path. The pain and darkness encountered usually makes them turn around before the path of destruction is reached. A reader asks about an apparent conflict. Yet I have taught that it can be hazardous to single out an individual of low vibration to send love to. Sending love to ALL or the whole body of humanity is a much different thing than singling out a single person. When love is sent to all and hate to none you are then sending to humanity as if it were one great life form. This is like sending love to your entire body instead of individual cells. Sending love to specific individuals can create a number of problems, the most prominent of which is the interference of free will. If we are talking about spiritual love here there are many people who are not prepared to receive it and do not wish to have it sent to them. When love is sent to ALL or the body of humanity, each can tap into the love energy that is fitted to his own consciousness and free will is not upset. But sending one’s own version of Love to one who does not desire it is like force feeding a friend peas for his own good even though he may hate peas. A disciple can discern through the soul who is ready to receive the love he has to offer and it will flow naturally through a sense of giving and receiving. If the disciple comes across one who does not chose to receive love he will not send it, just as Jesus did not send it to the Pharisees. But neither will the disciple send hate, bitterness or any other negative feeling. Instead, he will stand in the center of peace and harmlessness and make his love available if it should be desired. Another reason that we need to use discernment is that there are numerous ways that we as humans interpret what love is. I have had people tell me they love me and will pray for me when in reality I have felt waves of hate coming from them. Other times I have felt the energy of well meaning people sending their version of love to me and have found it quite annoying, for the love was sent for the purpose of changing my mind which I did not want to change. Then there have been times that love naturally flowed when I was willing to give or receive and the experience was heavenly. If a person of high vibration sends love to one of lower vibration the lower will pick it up all right, but by the time it filters through his solar plexus the love will be transmuted to selfish desire which is his way of seeing love. “If we send Light and Love to anyone on the dark path or of a low vibration, or someone who will use power contrary to the good of the whole then the Light and Love we send will be transmuted to the lower centers and all we will do is energize the lower desires of these people. “Many Light Workers at the beginning of World War II made the mistake of sending Light and Love to Hitler and it only had the effect of energizing his lower self rather than making him more sensitive to the needs of others. It is always safe to send Love to all of humanity or a large number of people because there will always be a number of people who are happy to receive it of their own free will. 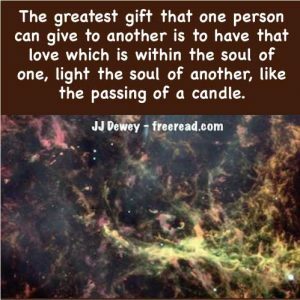 We should send love to individuals who desire it of us or when we are moved upon by the inner self. We should send hate to none, wish peace to all and make love available to all who wish to receive and be edified.